Wetlands provide water purification through the retention of nutrients, pathogenic organisms, sediments and pollutants. The Wingecarribee Swamp provided this service for the Wingecarribee Reservoir. The Wingecarribee Reservoir, which is fed through the Wingecarribee Swamp is part of the Shoalhaven Scheme. 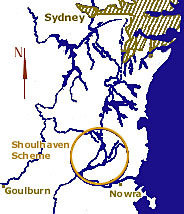 The Shoalhaven scheme is part of the regional water supply. The Wingecarribee Reservoir supplies water for up to 40,000 people in Bowral, Robertson and Wollongong as well as supplying Sydney in times of water shortage. Click on the map to see more detail of the Shoalhaven scheme. A brief study of northern hemisphere literature shows that peat has a capacity to retain metals such as iron, inorganic compounds such as the plant nutrients phosphorus and nitrogen, and organic material. Lake Wingecarribee is relatively shallow and receives most of its inflow from agricultural areas on fertile soils based on the Robertson volcanic rocks. This makes the lake particularly susceptible to eutrophication due to the gradual accumulation of plant nutrients. Blooms of potentially toxic blue-green algae already occur there. The peat of the Wingecarribee swamp acts as a sink for phosphorus, a major nutrient implicated in the development of algal blooms. The swamp also appears to be an effective trap for suspended matter and bacteria carried by the inflows, particularly during smaller flood events.